Full of personal, profound anecdotes, memories, tips and advice, Kathy Staff shares her wisdom on family life - what makes it work, how to cope when things get difficult, how to make the most of the love and joy which is the ideal of every family. - Publisher Full of personal, profound anecdotes, memories, tips and advice, Kathy Staff shares her wisdom on family life. She explores what makes it work, how to cope when things get difficult and how to make the most of the love and joy which is the ideal of every family. 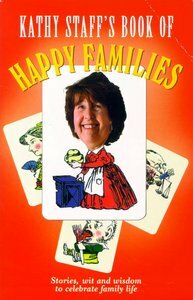 About "Kathy Staff's Book of Happy Families"
Full of personal, profound anecdotes, memories, tips and advice, Kathy Staff shares her wisdom on family life. She explores what makes it work, how to cope when things get difficult and how to make the most of the love and joy which is the ideal of every family.